I've wanted to do a more comprehensive post on the dynamics of endogenous money and the private sector's response to large exogenous events such as quantitative easing, but for now this post will be another incremental update to my previous posts on the topic from October and April. As stated previously, it's possible I've reached some incorrect conclusions, however my interpretation of a piece of Post-Keynesian Circuitist literature I was referred to suggests to me that these ideas are on the right track. "When the Fed buys an asset, the effect on the broad money supply depends on who sold the assets and what they do with the funds they receive. If the seller is a bank, reserves go up, but broad money only increases if the bank responds to the increase in its reserves by lending more to households and businesses. If the seller is an investor other than a bank, reserves go up, and broad money also goes up in the first instance as the seller's bank puts a sum equal to the amount it receives from the Fed into the seller's bank account. But if the seller uses the money to pay down debt, the broad money supply declines again by the amount of the debt repayment. As of early 2011, the behavior of the broad money supply, economic activity and inflation all suggested that recent money growth had not been excessive." The guide mentions the well known idea that the broad money supply increase resulting from QE has been muted due to debt repayment, but as my past posts have indicated, I think that's only half the story. The first graph shows broad money supply as measured by MZM (Money Zero Maturity), the second graph shows the year on year change. 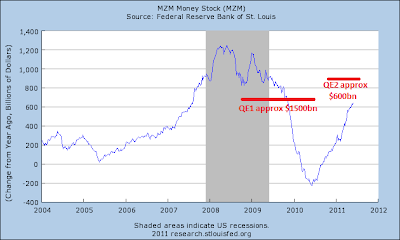 It's not obvious that either QE program had a direct impact on the broad money supply trends, even though they should have if you consider only the direct mechanical results of the Fed buying bonds, and don't consider any private sector response! Of course it is difficult to tell for sure, as the money supply changes for lots of reasons besides just QE (e.g., it generally expands during economic growth, but perhaps also during times of uncertainty). So where did part of the roughly $2 trillion in "money" that replaced bonds go? Did it only "disappear" to the extent that the private sector wanted to pay down debt? I've argued that it disappeared INDEPENDENTLY of whatever level of desire there was to pay down debt, and that the money supply growth that did occur would have occurred to almost the EXACT SAME DEGREE even if QE had not happened. In other words, money supply grew because the private sector "wanted" a larger money supply as part of its aggregated portfolio preferences. The private sector controls all quantities with white labels. Excess reserves, with a yellow label, is the only quantity here fully controlled by government! The light yellow label on Required Reserves indicates partial control. Banks lend first and look for needed reserves later, and the Federal Reserve's open market operations ensure that reserves sufficient to meet reserve requirements will automatically become available (either as a result of the Fed buying/selling treasuries as part of OMO, or via loans from the Fed). So the quantity of Required Reserves adjusts in response to changes in the quantity of Bank Loans, and the government only controls the size of Required Reserves if it changes the rules. 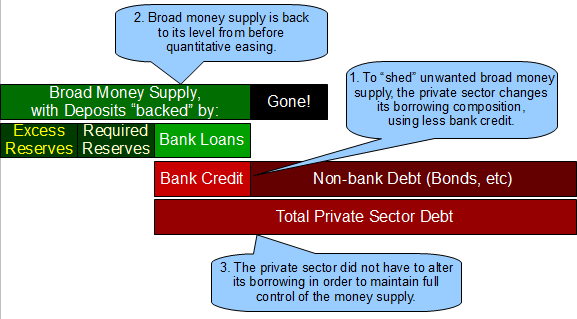 Lastly, consider how the private sector can work to "undo" the change in money supply imposed by QE, without having to alter its borrowing desires! One of the reasons bank loans can be replaced by other forms of borrowing (perhaps with a lag?) is that when you look inside the aggregates, the economy is very dynamic under the surface. There are always some households and companies borrowing new money, others making debt repayments and others completely paying off debt. Some bank loans may be repaid early and replaced by non-bank borrowing, but in general there is always new borrowing being done, even when the big picture is one of deleveraging. When there is "excess" money and investors would rather hold bond assets, those investors will likely outbid banks in the contest to fund new borrowing needs. That is how the mix of bank debt versus non-bank debt can be affected. Even unconventional borrowing markets may play a part in this, such as "peer-to-peer" lending (going to family and friends for a loan instead of to the local bank). Another example of non-bank borrowing is new corporate equity issuance — perhaps angel investors and the like are outbidding banks on meeting funding needs, too. Replace loans (which create money) with non-bank borrowing (which does not create money) independent of total debt levels. Examples of non-bank debt include corporate bonds, peer to peer loans, securitized loan pools, housing agency debt, etc. Most of this post focused on this mechanism. Induce less bank lending by changing aggregated propensities to borrow. For example, many reports indicate a record number of cash buyers have been supporting the housing market. Logically, if there is an "excess" of deposits in the economy, then investors who would rather own other assets may outbid other potential buyers of those same assets who would have bought using debt. Thus, while QE's added money supply in this case doesn't eliminate existing bank loans, it serves to reduce the number of houses bought using bank loans, while at the same time other loans are continually being paid down. The net effect is that bank lending moves to a lower level than it would have been at had QE not occurred. Those who lost the bid for houses (who would otherwise have bought with a bank loan) might rent from the investors instead, so this point does not imply that QE will cause some to have no place to live. Banks can sell assets (treasuries, loans, etc) to the rest of the private sector. A net decrease in assets in this way causes a net decrease in broad money supply. To see how this works, visit the Macroeconomic Balance Sheet Visualizer, and choose the operation "Bank Loan" followed by "Bank Loan is Securitized" (which is one way banks sell assets to the non-bank sector). 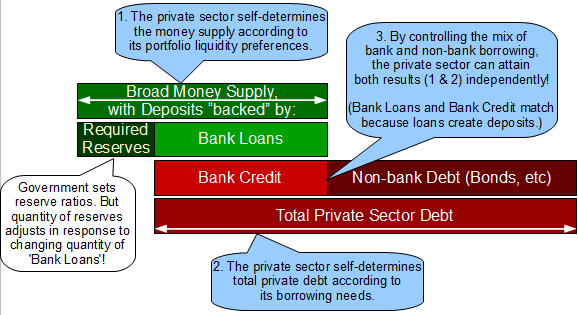 Banks can fund themselves with a higher portion of non-deposit liabilities (e.g., bonds) instead of deposit liabilities. This results in less broad money supply. As I understand it, this was part of the dynamic that RSJ described in this post. This shows in even stronger terms why Quantitative Easing as practiced so far (targeting quantities rather than prices) has had no meaningful effect other than on sentiment. 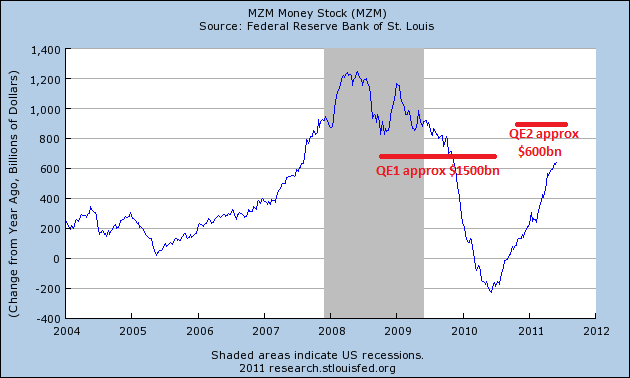 QE truly was a placebo. It lends even more power to the concept that money is always debt and can NOT be modeled like a commodity. Its quantity is extremely dynamic and subject to the portfolio desires of the private sector. IS/LM curves and the like are not relevant. One of the arguments by the Fed was that QE would increase deposits in portfolios relative to the supply of available bonds and provide a bid under other assets due to "formulaic" institutional portfolio investing, but the premise of persistently expanded money supply and reduced longer duration assets appears to be false. 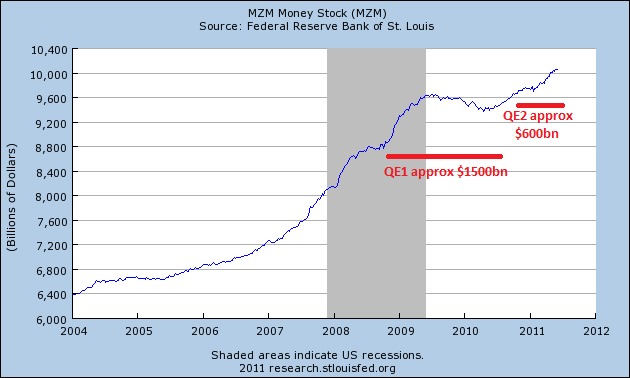 Conventional wisdom is that one goal of QE was to help the banking system. Ironically, QE may have hurt banks more than it helped them! The banking system seems to operate as a private sector lender of last resort, and by triggering a shift to additional direct (non-bank) lending, QE seems to have reduced the role of banks in the economy, and thus reduced their potential to accrue earnings from loans! Here is an updated chart from a previous post (Real GDP Growth in the US and Japan: A Closer Look at Consumption, Government Spending, Net Exports, Investment, and Inventories). 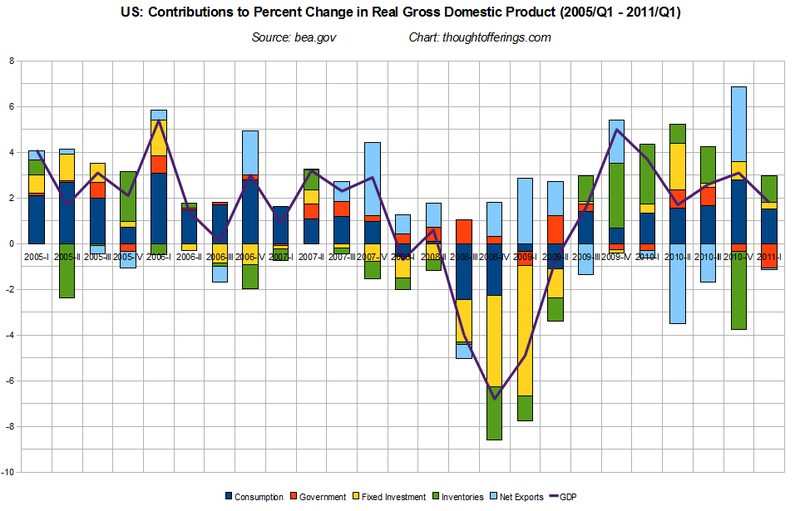 Note that 2010-2011(Q1) does not look all that different from 2005-2007! I don't know where to from here. I think a "double dip" is very possible but if I had to guess, I don't think a new recession is the most probable scenario in the near term. But that depends on difficult factors to predict such as whether current US congressional antics really are only short term theater as many allege, and the potential size of negative demand shocks from the rest of the world (China, Europe, other various housing bubble countries like Australia and Canada, etc). Similarly, deleveraging is not a drag on growth unless the rate of deleveraging increases. Deleveraging is just one determinant of the household savings rate. A stable household savings rate is growth-neutral. However, deleveraging does reduce the likelihood of a falling savings rate and the associated boost to GDP growth that such a shift would provide. So in terms of current economic growth (i.e., ignoring impacts on future growth), steady-state deleveraging is the absence of a positive rather than an actual negative. Note that this post only focused on GDP growth... clearly we still have crisis levels of unemployment and underemployment that policy makers should be actively working to address!